I hope I haven’t lost anyone. 🙂 To make this craft, you’ll just need some popsicle sticks, paper, glue, and scissors. Popsicle sticks actually cut nicely with a nice, sharp pair of scissors, and you can get colored popsicle sticks at the Dollar Tree. 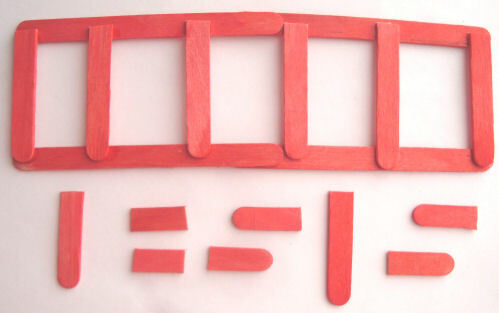 Start by gluing 2 popsicle sticks together long ways, overlapping the ends a bit. You will need to make 2 of these. Then cut 3 popsicle sticks in half (making 6 little half pieces) and glue them between the two long sticks like ladder slats. 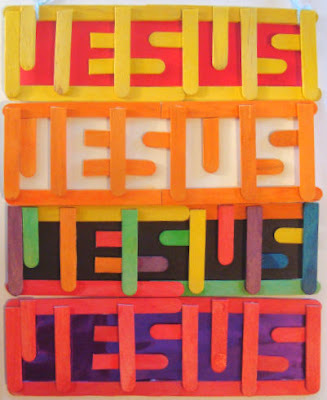 You need it to create 5 boxes total, one for each letter in “Jesus”. It’s best if the first box for the “J” is a little narrower than the rest. 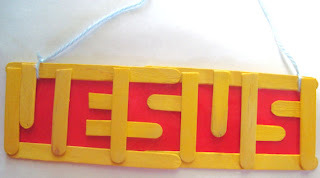 Then glue on little pieces of popsicle stick in each square to create the letters J E S U S. The letters don’t look perfect, but it is neat. I think the word actually looks a little digital. read than the others. My husband says he can’t see this one at all! It is easier to glue the popsicle sticks down onto paper or foam board then it is to create them “free standing”. This craft is a little advanced, so I think it would be appropriate for middle school aged kids up to adults. It might be a great craft to do with a high school youth group. Speaking as a former art major, this craft would be an excellent art project for studying positive and negative space. You could also use this to study contrasting colors. I really like the one that is yellow and purple, and I’m willing to bet it looks good with other pairs of contrasting colors as well. I saw it right away. I was kind of surprised when you said it was an optical illusion. 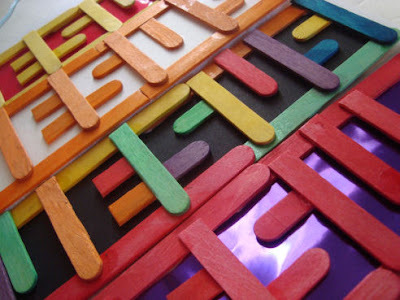 This craft could probably be adapted to younger children if the popsicle sticks are assembled before hand and they are set to glue different colored papers or cellophane on to the back. This is great….I hope to use this as our craft in our Kindergarden CCD class this month (Of course, the sticks all pre-ready). Love your website. I could see it right away, but the black isn't as obvious. I actually like the way the black name is more "hidden" so I think I'd be drawn to doing it that way. This is really neat and definitely a different sort of craft. Thank you! I could read it right away. Though maybe not if there had been a lot of the multicolor sticks on black. For some reason that's the hardest to see, probably all of the colors. This is a cool idea! 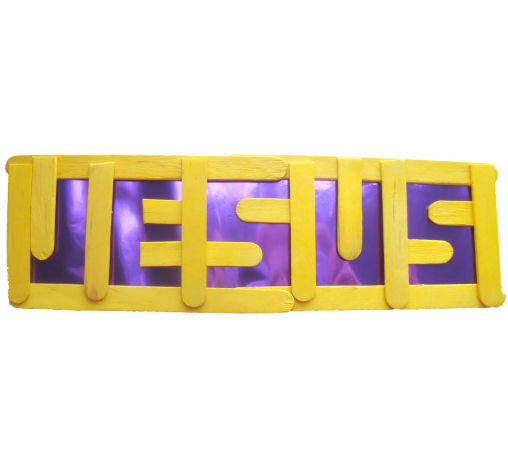 Such a snazzy craft and colorful expression of Our Lord's Holy Name! Definitely the multicolored one is the more difficult one to read. As for the others, the name of Jesus just pops right out at you! Interesting craft idea. I love reading your blog, although I'm ashamed to admit I haven't actually found time to DO any of the crafts yet. Love this! 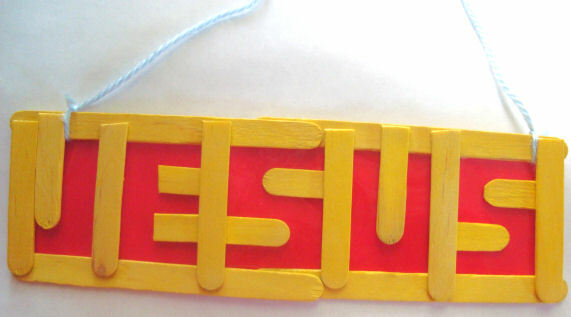 Adding a link to this craft to http://www.squidoo.com/creative-easter-resources as a part of crafts from reused items (popsicle sticks)! I was curious if this was your design or someone else’s. This exact project is being sold by Lifway.com for this years VBS at .80c each and talks about how it is an illusion and everything, just curious to see I will not order any if they used your idea and selling it without your permission. It’s not a font- I don’t have the complete alphabet. Sorry! do you have any link where I might find the alphabet?? 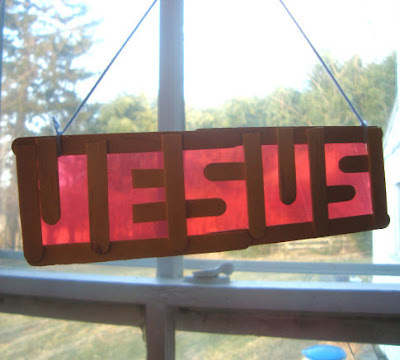 We did this craft this morning in my second grade faith formation class that I teach! I could see Jesus right away but I’ve been planning on doing this a while so I’ve checked out the site several times. Nice fun and quick craft! Thanks! My 3rd grade sunday school class did this craft today and loved it! One student said it was the best craft ever! Thanks so much for sharing the idea!